Consider the birds. They don’t worry, but they’re not without their problems. They have to fly south for hundreds of miles in order to survive the winter. Their eggs may be eaten by snakes or other predators. They age and die. 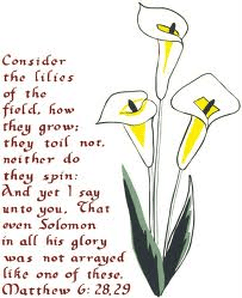 Consider the lilies. They’re beautiful, but what happens to them? They wilt, get cut down, and are throw into the fire. Trusting in the providence of God doesn’t mean ignoring reality. People die. Kids have accidents and sometimes even get killed. Stocks plunge. Companies go bankrupt. Couples get divorces. Some people will tell you that the best way to overcome worry is to put it out of your mind. ‘Just don’t think about it,’ they’ll say. But you can’t do that for long. The best way to overcome worry is to face the truth: you will have trouble in this world. But God will enable you to through it. Jesus said, “I have told you these things, so that in Me you may have peace. In this world you will have trouble. But take heart! I have overcome the world.” -John 16:33The providence of God is not shallow. 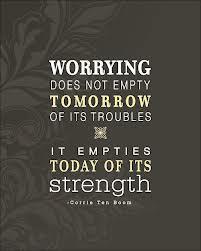 Jesus didn’t say, ‘Nothing bad is ever going to happen to you; everything is going to be find, so quit worrying.’. If you think nothing really bad is going to happen to you, your peace is unrealistic and temporary. You’re going to be devastated when hard times hit- and they will hit. God’s providence doesn’t mean nothing bad will happen to you, but it does mean that God will reinforce and strengthen you through whatever tragedy you face. Trusting God’s providence means believing that whatever happens- even persecution or death- God will see you through.